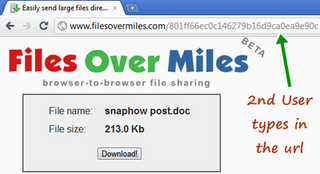 FilesOverMiles is a tool for direct file sharing, fast and secure way to send files over the Internet. No setup or sign up and the file transfers are not stored anywhere. It will appeal to many professionals who want to share files securely and efficiently. Step 1 : Go to FilesOverMiles website. Click "Browse" and select the file to transfer. Note : The transfer file will continue to be available for download until the web page on 1st user’s browser is closed. Thanks. Mail is also now equally powerful and many providers like hotmail allow attachments in Gbs. Also worth mentioning is torrents.